The SDF aims to connect with 4 lakh people in the state and take their suggestions to prepare manifesto for the April 11 Assembly and Lok Sabha polls. 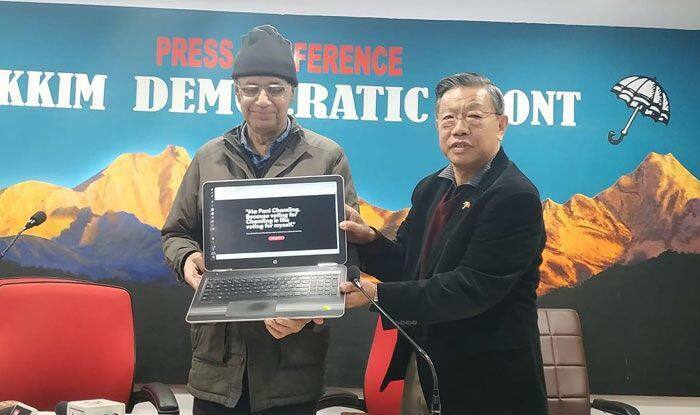 The ruling Sikkim Democratic Front (SDF) has launched the “Ma Pani Chamling” campaign to build an inclusive manifesto, incorporating people’s aspirations for the upcoming polls. The campaign was launched by party’s publicity head Bhim Dahal and social media head and Lok Sabha MP Prem Das Rai at party headquarters here on Saturday. Through the campaign, the SDF aims to connect with 4 lakh people in the state and take their suggestions to prepare manifesto for the April 11 Assembly and Lok Sabha polls in the state. A website — www.mapanichamling.com — was also launched to receive people’s suggestions for shaping Sikkim’s future. “The ‘Ma Pani Chamling’ (I am Chamling) campaign is a reflection of the party’s ethos that people are the king in a democracy. The campaign will involve every Sikkimese in building the Sikkim of their dreams,” Dahal said. Rai said in line with the party philosophy, the SDF is organising the largest participative agenda-setting exercise in Sikkim’s history to enable people to set the agenda of the incoming SDF government. “Our party president, Chief Minister Pawan Chamling, had given the clarion call of ‘Youth First’ and hence we first sought the views of youth through the ‘MyFirstVote4Chamling’ campaign. We are also going door-to-door with the ‘SDF Pariwar’ campaign to gauge the views of the people. We are the only party to put Sikkim and Sikkimese first,” Rai said. The party will also seek suggestions from experts and specialists through different outreach programmes. According to a source, the campaign aims to leverage “Big Organizing” strategy, which was adopted by Democratic candidate Bernie Sanders in the 2016 US presidential campaign. “In a first, we will attempt to engage thousands of volunteers to play leadership role in the campaign by decentralising the process,” he said.